Throughout the world, papaya has different names. It is called ‘pawpaw’ in Europe, ‘fruta bomba’ in Cuba, ‘papaye’ in France, and ‘mamao’ in Brazil. It’s botanical name is Carica Papaya and it belongs to the pawpaw family. Did you know that papaya is a berry? 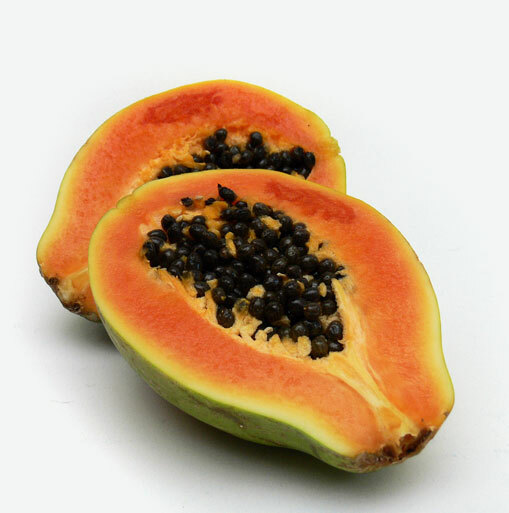 Papayas have edible black seeds inside that have a spicy, pepper-like flavour. Some cultures believe that the papaya tree is “the medicinal tree” because its seeds and leaves have been used to make medicine. Papayas have an enzyme called Papain that breaks helps to break down protein in meat to make it tender and can be used as a meat tenderizer. They are also abundant in vitamin C, a necessary vitamin for healing burns and wounds and are a great source of folate which the body needs to help combat fatigue and stress. It’s easy to select papayas. If you are going to eat them right away, look for fruit that’s mostly yellow in colour and slightly soft to the touch. Papayas that are mostly green with a bit of yellow colour, and firm, will be ready to eat in a few days. Most papayas at the supermarket need to be ripened at home. Ripen them at room temperature in a dark place for 2 to 3 days. The fruit turns yellow when ripe. Check daily as they are ripening.To speed up the ripening process, place papayas near fruits like apples, bananas or pears. Place inside a paper bag, loosely closed for a day or two. It can be stored for up to four days but tastes best when eaten within a few days of being ripe. Papaya also tastes great when mixed with other foods. Here are some tasty ways for you to enjoy papaya: Add sliced papaya to a fruit plate or fruit salad. Mix papaya cubes or slices with honeydew melons and strawberries for a healthy fruit salad. Use sliced papaya for a colourful and edible garnish. Top pancakes or waffles with papaya slices. Toss papaya slices into a green salad. Sprinkle papaya seeds on a salad to add spice. Mix papaya into low fat yogurt or low fat cottage cheese. You can make tropical kabobs with papaya cubes, ham, pineapple chunks and shrimp.